One of the great things about writing your own blog is that you get introduced to new exciting websites. I had not heard of Bling Rocks until last week, now their site is becoming one of my favourite places on the web. Bling Rocks is a fashion forward on line jewellery retailer offering on trend pieces at affordable prices from- bracelets, earrings, necklaces and gifts for adults, teenagers and children. which are massive trends this season. 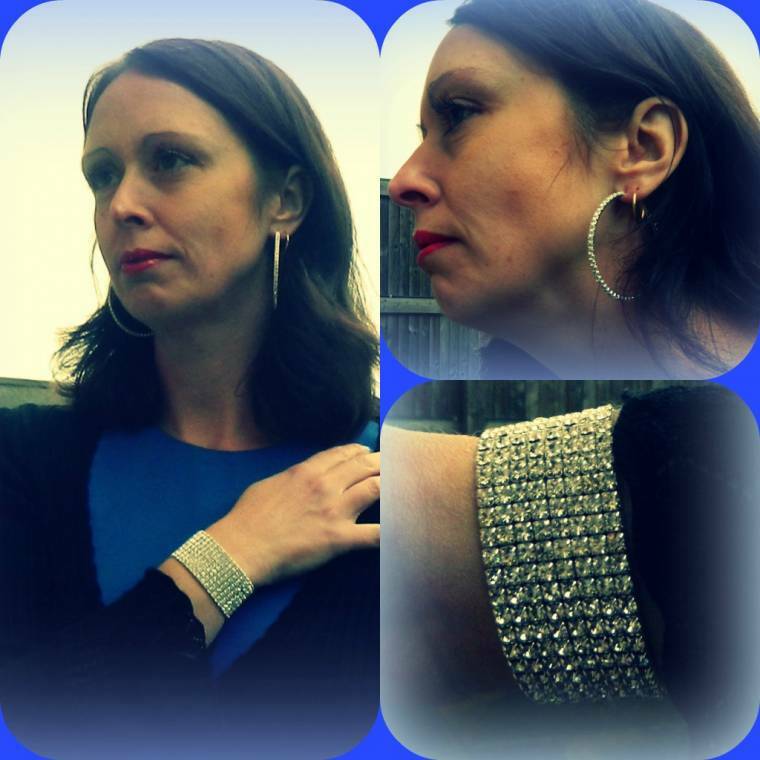 Bling Rock kindly sent me 2 pieces of their jewellery range to review,a sparkle crystal cuff bracelet and some Silver Glitz Hoop Earrings. The first thing I noticed was how beautifully packaged up they were. Wrapped in black and white Zebra patterned tissue paper ( which I excitedly rip open before having a chance to photograph it!! ). Inside the items came in this Bling Rock box ( top right) Both items were also wrapped in tissue paper (top left) and placed in these velvety black Jewellery pouches which made them such a lovely and exciting gift to receive. I love anything sparkly so was very happy with both items I received. The bracelet is a nice snug fit and has an expensive look and feel. As worn by Kerry Katona.. The shimmering Silver Glitz Hoop Earrings diameter are size 5.5cm and also priced at £14-99.I don’t usually go for hoops myself, so I was surprised how much I liked them. They look and feel great. I think the crystal diamante really sets them off, and they look lovely on!! If you cannot find a design or you would like to create a unique bracelet or jewellery item then you can also contact them and they will design & create your jewellery using our bespoke design service. Bling Rocks is also proud to support two charities, SANDS and Tommy’s for more details visit their Bling Rocks About Us page. "Link Up Your Favourite Posts This Week : Welcome To The Weekend Hop …"
The jewellery looks great Clairejustine! Lovely pictures and a good review.